Sprawling over an area of about 285sq.km, Parambikulam Tiger Reserve is tucked away in the valley between the Nelliampathy ranges and the Annamalai ranges. The sanctuary is located in Palakkad district of Kerala state. Popularly known as 'Nature's own abode' this sanctuary attract tourists to enjoy beauty of nature. Parambikulam were in two broad administrative units Sungam Forest Reserve and Parambikulam Forest Reserve, but owing to its growing wildlife needs, it was expanded in 1962. The sanctuary was established in 1985 with an area of 285sq.km. Previously it was known as Parambikulam Wildlife Sanctuary and it became the 38th Tiger Reserve and second of Kerala in 2010 February 19. The reserve contains around 20 Tigers, 51 species of Reptiles, 204 species of birds, 160 varieties of butterflies and other species. Parambikulam Tiger Reserve is rich in bird life, is noteworthy for its rich tropical rain and teak forest. Some trees are said to be over 400 years old. 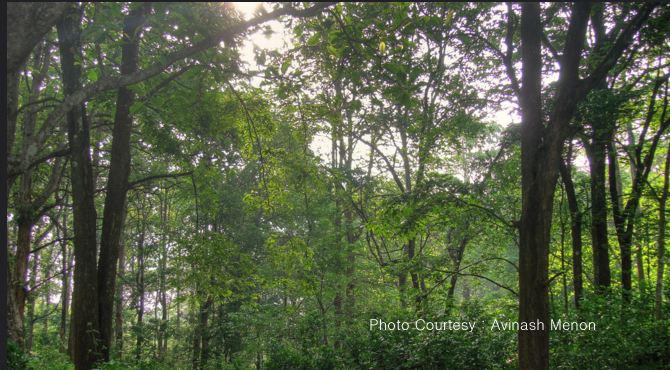 About 9,000 hectares of teak plantations are found in Parambikulam. Besides its rich flora and fauna the sanctuary contains three dams, and the dammed waters are home to a variety of endangered species such as crocodiles, otter, turtles etc. The visitors can also avail and enjoy the boating facilities provided at the dams where one can observe the Gaur, Mugger crocodiles on the water's edge. Boating fee Rs 200 for 5 persons or less for one hour; Rs 400 for a group of up to 8, plus 2 guides. The sanctuary also offers good trekking also. Now the forest department conducts treks at Parambikulam. There are three kinds of organised treks offered by the Forest Department: a soft trek takes you a distance of 6 km and costs Rs 50; a medium trek is 10 km long and costs Rs 75 or Rs 100 (2-6 persons and guide)); and a hard trek is a 20-km long walk through difficult terrain and costs Rs 200 (6-10 persons and 2 guides) or Rs 300 (10 persons and 3 guides). It is compulsory to be accompanied by a guide on these treks, so trek costs are calculated including the allotment of one tribal guide for every group of three persons. The famous among the treks are Karimala Gopuram (1,438 m), followed by Vengoli Peak (1,120 m). There is also a chance to see the Nilgiri tahr on these hills. Treks through selected routes in the forest can be arranged with overnight stay in watchtowers with the help of the local people. The sanctuary has a vast marshy grasslands. Apart from the thickly wooded stands of bamboo, rosewood and sandalwood, Parambikulam had an abundance of teak tree. The prime attraction here is the oldest and Asia’s largest teak tree, Kannimaram, which is 40m in height and 6.4m in breadth (girth). It is located about 5 Km. from Thunakadavu (headquarters of Parambikulam sanctuary). This place is considered to be a good place for spotting herbivores.The hilly and rocky terrain gives a mystical touch to the sanctuary and it is drained by several rivers, including Parambikulam, Sholayar and Thekkedy. The most protected ecological piece of Anamalai subunits of Western Ghats, this virgin valley is the home of rare and exotica fauna and offers a scintillating sight of rare wild animals. Mammals such as leopards, wild dogs, sloths, wild boar, barking deer, spotted deer, langurs, porcupines etc can be seen here. It also has one of the largest population of gaur (also know as Indian bison) and mugger crocodiles have seen on the banks of the reservoirs. The avian population comprise such as Common Kingfisher, Ceylon frogmouth, Nilgiri wood pigeon, Malabar grey Hornbills , Great pied hornbills, Broad-billed roller, Black woodpecker, Darter, Little cormorant, Quail, Kingfisher, Egret, Falcon, Owl, Nightjar, Drongo, Barbet etc. Dr. Salim Ali, the world famous Ornithologist had found more than 100 species of birds at Parambikulam sanctuary. Parambikulam also has a rich collection of reptiles including the Mugger crocodile, Pond terapin, Cane turtle, Spectacled cobra, Python, Flying lizard, Turtle etc. For providing a better view of the sanctuary, two watchtowers are located at Anappadi, 8km from Thunakadavu, and Zungam, 5km from Thunakadavu.